Last Saturday @michaeljanz organized the first ever Edmonton IDEAfest. This event featured a diverse range of presentations which were submitted by students and members of the community. Topics ranged from atheism to Twitter to “The one thing George Bush did right.” Daveberta has a writeup and links to a couple other people who sing the praises of a conference that was developed through social media (Facebook and Twitter) over two weeks. Now, this event didn’t come without criticism. One presenter (who I’ll call X since he/she has since deleted their post, Twitter account, and locked the blog after saying a gratuitous good bye to the blogosphere – if you care it likely won’t take you long to figure out who X is) was especially unimpressed with what X perceived to be a lack of diversity in the speakers and attendees of the event – both in terms of gender and race. And the male-female ratio in Edmonton is slightly biased toward women with 51% of the population being female. Now, the university population may be different, but I think the idea of this festival was to reach the broader Edmonton community, so I’ll stick with those stats. 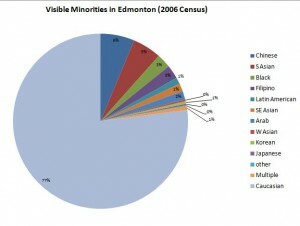 So we can see that a only 23% of Edmonton are POC as X would say. POC standing for Peoples of Colour (capitalization abounds). I hadn’t really come across this term before, and it starts coming across as a bit pretentious, but that’s beside the point. If only 23% of the target audience are visible minorities, then should we be really surprised if more than a handful of the presenters are minorities? Sometimes it’s not racism, it’s just cold statistics. I know many of the organizers well, and I wouldn’t call any a racist or bigot. With that said, it’s always possible for even the most progressive minded among us to harbour biases that we are unaware of, and oftentimes our circles of friends aren’t as diverse as they could be. It is definitely clear that few women presented. While I wouldn’t advocate rejecting applications or forcing gender balance, efforts could be made for next time to find women who could present. There were definitely a number of women in the audience, and I would count that as a success. After a few discussions through Twitter and blog comments, X has pulled the proverbial plug on Web 2.0, severing any ties that could have been used to promote progress rather than serve for discourse. While I defended X in the initial dialogues that we all had, I must say I am immensely disappointed that X would behave this way. By presenting only criticism and not providing solutions, and then by refusing to even take part in further dialogue, the likelihood of these issues being solved and discussed is greatly decreased – leading only to greater frustration in the future for advocates as vocal as X. It seems in the end, the irony arises that the one who brought issues of sensitivity to light was the one who was too sensitive. It’s too bad X wouldn’t continue fighting the good fight. I agree that although his original argument was off-base, his intent was probably supported by many. Cut and running will do little to bring his argument forward. Research also shows that people are quite willing to go along with racism (in the sense that they won’t always speak out about it) even if they might express vehement disgust when questioned about racism. Other research also shows that we all have certain biases, including about our own ethnic groups! I am really sorry to have missed this. From what I have gathered from this post, it sounds like X is quite insecure with his own set of biases. I know it is cliche, but there is something to be said about ‘crying wolf’. He should be saving his strength for battling legitimate imbalance. Using the Term People of Colour/POC is something I come across quite frequently in sociological writings, and from what I gather seems to at least be a popular substitute for “visible minorities” among present day sociologists. You also hear the term used quite frequently by groups representing POC/Visible Minorities. It was, indeed, a bizzarre comment. He could have at least said “unembedded racism”, given the antidisestablishmentarianist overtones of many of the presentations (sorry, I couldn’t resist). Let’s look at how this was organized: Michael Janz has the idea. He takes the risk and burden to plan it. He puts it on facebook and invites all of his friends (just checked on facebook, and his 1500+ friends are very diverse). Some of them talk about it and invite some of their friends, etc. Mostly white people come out. Big deal. By the way, Stella is an Asian female, and she had a good group show up for her presentation (and they didn’t even know that she brought treats). I kind of doubt that the ethno-diversity of any event in Edmonton will have proportionately more visible minorities in attendance, just because of the census chart. If we wwanted to, we could target non-caucasian presenters, and they would likely bring out a crowd of their heritage. That would be cool, but diversity for the sake of not appearing to exclude anyone doesn’t really make sense. Nobody was excluded from this event.